Here is the unofficial problem bank list for August 30, 2013. This week, the FDIC finally released industry results for the second quarter and its enforcement actions through July. For the week, there were 11 removals and four additions. The changes leave the Unofficial Problem Bank List holding 707 institutions with assets of $250.6 billion. A year ago, the list held 891 institutions with assets of $331.5 billion. For the month, the list declined by a net 22 institutions and dropped $102 billion of assets. Monthly activity included six additions, one unassisted merger, four failures, and 23 action terminations, which was the most action terminations in a month since 25 cures in April 2012. With second quarter industry results, the FDIC said there are 559 institutions with assets of $192 billion on the Official Problem Bank List. The difference between the two lists dropped by one institution to 148. We had anticipated for the difference to narrow to about 135. The FDIC terminated actions against Inland Bank and Trust, Oak Brook, IL ($1.0 billion); Highland Bank, Saint Michael, MN ($429 million); Community Bank of Oak Park River Forest, Oak Park, IL ($272 million); First Southwest Bank, Alamosa, CO ($237 million); Signature Bank, Bad Axe, MI ($224 million); The Union Bank, Marksville, LA ($219 million); Community Trust & Banking Company, Ooltewah, TN ($131 million); Metropolitan Bank, Oakland, CA ($128 million); Cambridge State Bank, Cambridge, MN ($69 million); Elysian Bank, Elysian, MN ($42 million); and Vermont State Bank, Vermont, IL ($17 million). Additions this week include United International Bank, Flushing, NY ($177 million); State Bank of Taunton, Taunton, MN ($71 million); Allendale County Bank, Fairfax, SC ($59 million); and Citizens Bank of Chatsworth, Chatsworth, IL ($48 million). Not much new to report on Capitol Bancorp Ltd. other than its outside counsel squawking at the FDIC labeling its actions "imprudent and counterproductive." Within an article published by SNL Securities - Capitol Bancorp legal rep slams FDIC's 'imprudent and counterproductive actions', Andrew Sandler, chairman of BuckleySandler LLP, said "The FDIC is operating with extraordinary powers and seems all too willing to ignore judges, experts and others in effecting closures." Five banks controlled by Capital Bancorp have failed, which have cost the bank insurance fund an estimated 48 million. The FDIC could utilize the cross-guaranty provisions of FIRREA to assess the cost of the failures against the remaining banks controlled by Capitol Bancorp, which could lead to their failure. CR Note: The first unofficial problem bank list was published in August 2009 with 389 institutions. The list peaked at 1,002 institutions on June 10, 2011, and is now down to 707. Other key reports include the ISM manufacturing report on Tuesday, the trade deficit on Wednesday, and August auto sales also on Wednesday. All US markets will be closed in observance of the Labor Day holiday. Early: The LPS July Mortgage Monitor report. This is a monthly report of mortgage delinquencies and other mortgage data. 9:00 AM: The Markit US PMI Manufacturing Index for August. The consensus is for the index to increase to 53.9 from 53.7 in July. 10:00 AM ET: ISM Manufacturing Index for August. The consensus is for an derease to 53.8 from 55.4 in July. Based on the regional surveys, a decrease in August seems likely. The ISM manufacturing index indicated expansion in 55.4% in July. The employment index was at 54.4%, and the new orders index was at 58.3%. 10:00 AM: Construction Spending for July. The consensus is for a 0.3% increase in construction spending. All day: Light vehicle sales for August. 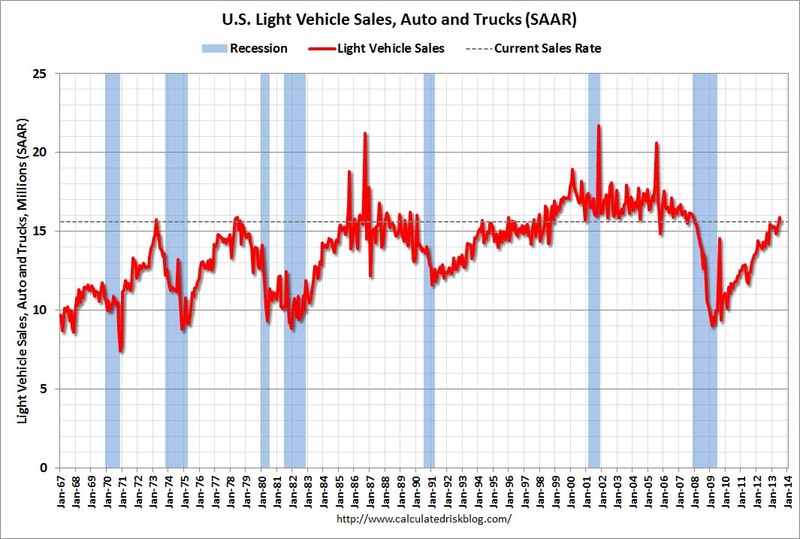 The consensus is for light vehicle sales to increase to 15.8 million SAAR in August (Seasonally Adjusted Annual Rate) from 15.7million SAAR in July. 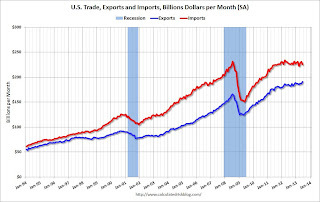 Imports decreased in June, and exports increased. 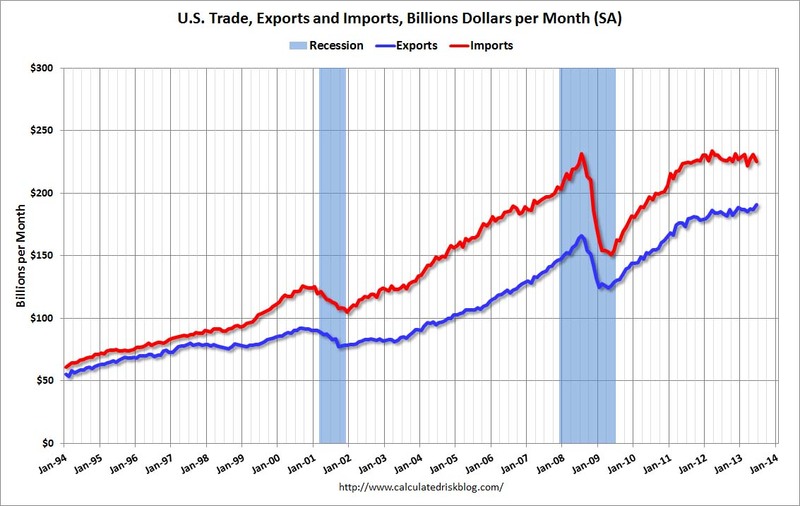 The consensus is for the U.S. trade deficit to increase to $39.0 billion in July from $34.2 billion in June. 8:15 AM: The ADP Employment Report for August. This report is for private payrolls only (no government). The consensus is for 177,000 payroll jobs added in August, down from 200,000 in July. 8:30 AM: The initial weekly unemployment claims report will be released. The consensus is for claims to decrease to 330 thousand from 331 thousand last week. 10:00 AM: ISM non-Manufacturing Index for August. The consensus is for a reading of 55.0, down from 56.0 in July. Note: Above 50 indicates expansion, below 50 contraction. 10:00 AM: Manufacturers' Shipments, Inventories and Orders (Factory Orders) for July. The consensus is for a 3.4% decrease in orders. 10:00 AM: Trulia Price Rent Monitors for August. This is the index from Trulia that uses asking house prices adjusted both for the mix of homes listed for sale and for seasonal factors. 8:30 AM: Employment Report for August. The consensus is for an increase of 175,000 non-farm payroll jobs in August; the economy added 162,000 non-farm payroll jobs in June. The consensus is for the unemployment rate to be unchanged at 7.4 in August. 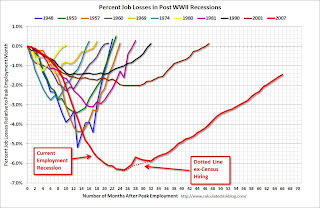 The following graph shows the percentage of payroll jobs lost during post WWII recessions through July. The economy has added 7.3 million private sector jobs since employment bottomed in February 2010 (6.7 million total jobs added including all the public sector layoffs). 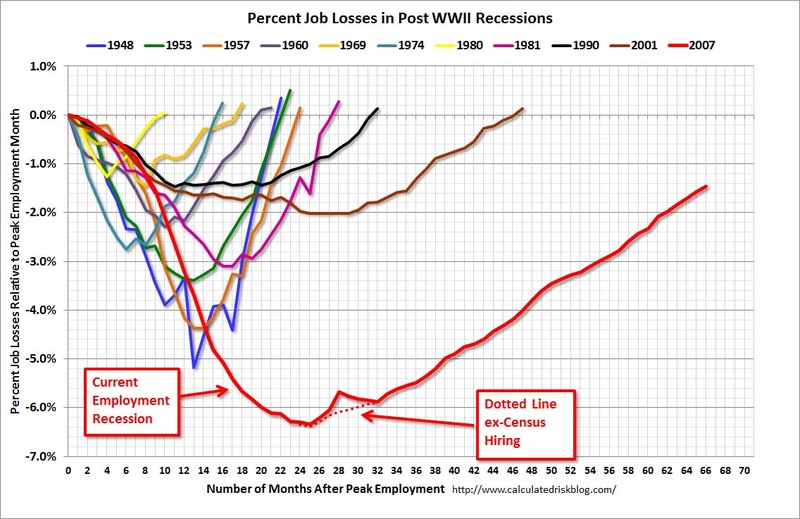 There are still 1.5 million fewer private sector jobs now than when the recession started in 2007. Note: The automakers will report August vehicle sales on Wednesday, Sept 4th. 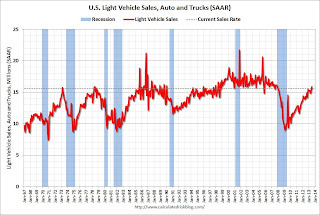 According the Bureau of Economic Analysis (BEA), light vehicle sales in July were at a 15.7 million rate, on a seasonally adjusted annual rate (SAAR) basis. It looks like August sales will be in the same range. In August, new light-vehicle sales, including fleet, are expected to hit 1,460,000 units, up 13.6 percent from August 2012 and up 11.0 percent from July 2013. The seasonally adjusted annual rate (SAAR) for August 2013 is estimated to be 15.6 million, up from 14.5 million in August 2012 and down from 15.8 million in July 2013. With consistency in the fleet environment, total light-vehicle sales in August 2013 are also expected to increase by 12 percent from August 2012 to 1,495,400. Fleet sales are expected to account for 15 percent of total sales, with volume of 225,000 units. PIN and LMC data show total sales reaching a 16 million unit SAAR in August, which is the highest since November 2007, with actual unit sales the highest since May 2007. For August 2013, new light vehicle sales in the U.S. (including fleet) is expected to be 1,464,214 units, up 14.4 percent from August 2012 and up 11.8% percent from July 2013 (on an unadjusted basis). The analyst consensus is for sales of 15.8 million SAAR in August. Fannie Mae reported today that the Single-Family Serious Delinquency rate declined in July to 2.70% from 2.77% in June. The serious delinquency rate is down from 3.50% in July 2012, and this is the lowest level since December 2008. Earlier Freddie Mac reported that the Single-Family serious delinquency rate declined in July to 2.70% from 2.79% in June. Freddie's rate is down from 3.42% in July 2012, and this is the lowest level since April 2009. 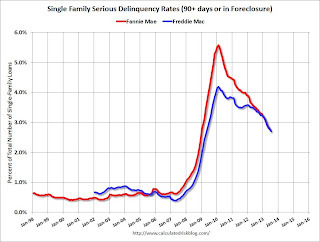 Freddie's serious delinquency rate peaked in February 2010 at 4.20%.. The Fannie Mae serious delinquency rate has fallen 0.8 percentage points over the last year, and at that pace the serious delinquency rate will be under 1% in just under 2 years. Note: The "normal" serious delinquency rate is under 1%. Maybe serious delinquencies will be back to normal in mid-2015. 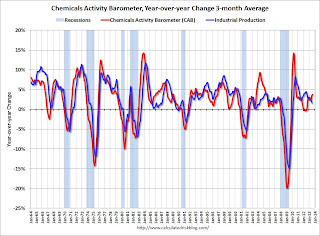 Chemical Activity Barometer for August shows "Economy on the Upswing"
This is a new indicator that I'm following that appears to be a leading indicator for the economy. The pendulum of the U.S. economy remains on the upswing, according to the American Chemistry Council’s (ACC) monthly Chemical Activity Barometer (CAB), released today. 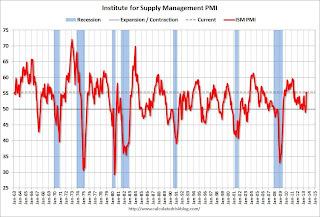 The economic indicator, shown to lead U.S. business cycles by an average of eight months at cycle peaks, increased 0.1 percent over July on a three-month moving average (3MMA) basis, marking its fourth consecutive monthly gain. The barometer is now up 3.8 percent over a year ago, the largest year-over-year increase since September 2010. The index itself is at its highest point since June 2008. Prior CAB readings for March through July were all revised. “As we approach the fourth quarter, the U.S. economy seems to be making strides, compared to the baby steps of earlier in the year,” said Dr. Kevin Swift, chief economist at the American Chemistry Council. 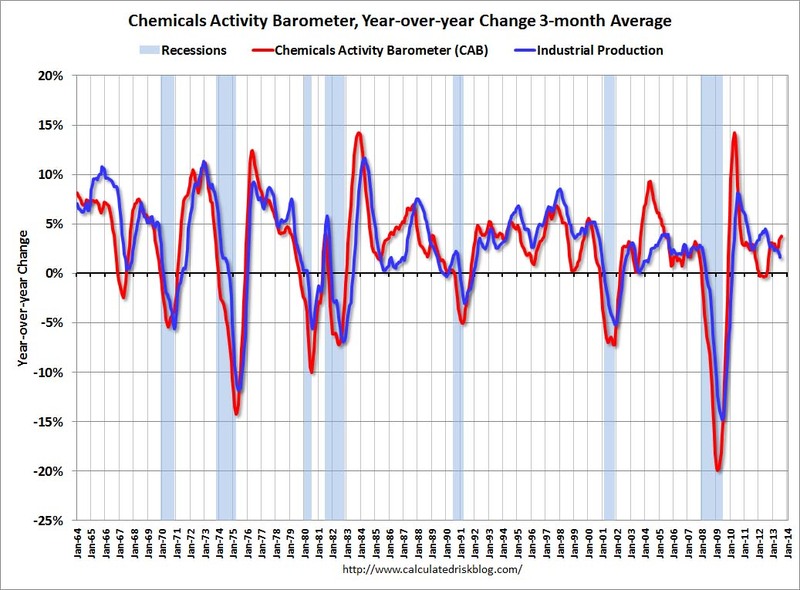 “The Chemical Activity Barometer is showing a strengthening of year-over-year growth and suggests an economy which finally may be gaining momentum,” he added. And this suggests that economic activity is increasing. The final Reuters / University of Michigan consumer sentiment index for August was at 82.1, down from the July reading of 85.1, but up from the preliminary August reading of 80.0. This was above the consensus forecast of 80.0. Sentiment has generally been improving following the recession - with plenty of ups and downs - and one big spike down when Congress threatened to "not pay the bills" in 2011. Unfortunately Congress is once again threatening to "not pay the bills" and that might impact sentiment (and consumer spending) late in September or in October. Personal income increased $14.1 billion, or 0.1 percent, ... in July, according to the Bureau of Economic Analysis. 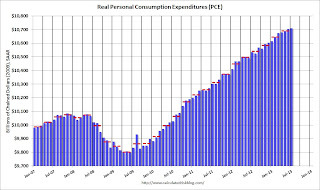 Personal consumption expenditures (PCE) increased $16.3 billion, or 0.1 percent. Real PCE -- PCE adjusted to remove price changes -- increased less than 0.1 percent in July, compared with an increase of 0.2 percent in June. ... The price index for PCE increased 0.1 percent in July, compared with an increase of 0.4 percent in June. The PCE price index, excluding food and energy, increased 0.1 percent, compared with an increase of 0.2 percent. Core PCE increased at a 2.6% annual rate in July, but only a 1.2% annual rate in Q2. 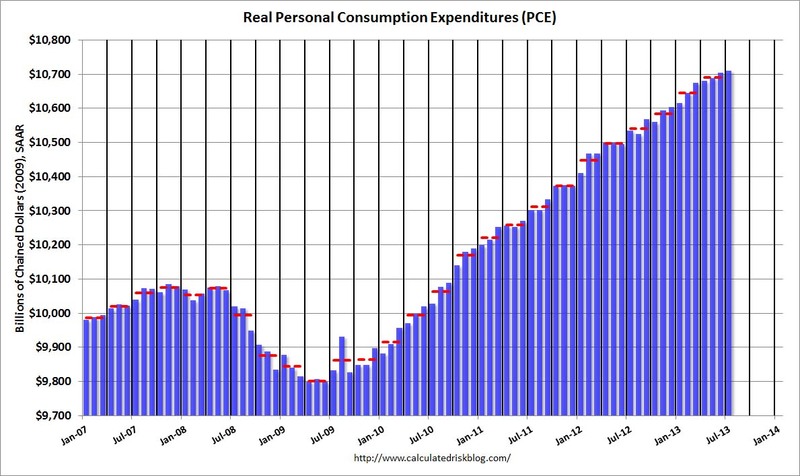 The following graph shows real Personal Consumption Expenditures (PCE) through July (2009 dollars). Note that the y-axis doesn't start at zero to better show the change. This is a slow start to Q3. On inflation, the PCE price index increased at a 1.1% annual rate in July, and core PCE prices increased only at a 0.9% annual rate. Back in June I posted four charts that I'm using to track when the Fed will start tapering the QE3 purchases. Here is an update to the GDP chart including the 2nd estimate of GDP released this morning (Q2 GDP growth was revised up to annual rate of 2.5% from the 1.7% advance estimate). Note: Here are the most recent updates to the four charts. I'll update two more charts tomorrow (PCE and core inflation). • 8:30 AM ET, Personal Income and Outlays for July. The consensus is for a 0.2% increase in personal income in June, and for a 0.3% increase in personal spending. And for the Core PCE price index to increase 0.2%. 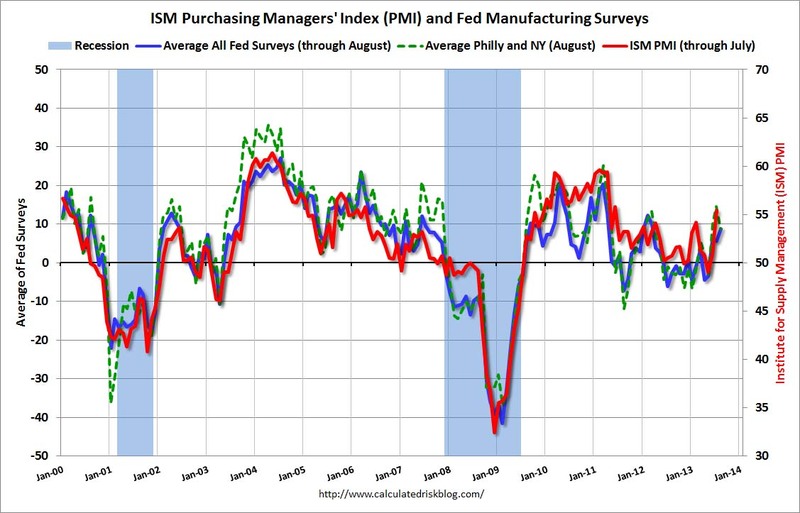 • At 9:45 AM, the Chicago Purchasing Managers Index for August. The consensus is for an increase to 53.0, up from 52.3 in July. • At 9:55 AM, the Reuter's/University of Michigan's Consumer sentiment index (final for July). The consensus is for a reading of 80.0. Six federal agencies on Wednesday issued a notice revising a proposed rule requiring sponsors of securitization transactions to retain risk in those transactions. The new proposal revises a proposed rule the agencies issued in 2011 to implement the risk retention requirement in the Dodd-Frank Wall Street Reform and Consumer Protection Act (Dodd-Frank Act) . The agencies requested comments on whether an alternative definition of QRM should include “certain underwriting standards in addition to the qualified mortgage criteria.” With the exception of the DTI and verification requirements, the QM doesn’t really have underwriting “standards related to risk. The “Dodd-Frank Act” had, among other things, two “definitions” of mortgages: “qualified mortgages,” to be defined by the CFPB and focusing on a borrower’s “ability to pay;” and “qualified residential mortgages,” to be defined by six regulatory agencies, focusing on mortgages with underwriting and product features related to the probability of default. A “qualified mortgage” would give lenders something of a “safe harbor” against future litigation, while a “qualified residential mortgage” would be exempt from risk-retention requirements associated with issuing mortgage-backed securities. In setting the “qualified mortgage” definition, the CFPB focused on (1) product features); (2) up-front fees charged; (3) verification of relevant borrower information; and (4) a maximum backend debt-to-income ratio (and implicitly a maximum front-end ratio) of 43% (with some exceptions). While the CFPB gave a list of factors creditors must consider in determining a borrower’s ability to pay, it did not dictate that creditors follow any particular underwriting model. In defining a “QM” the CFPB did not take into account many extremely important variables/factors that impact the probability that a mortgagor will default. 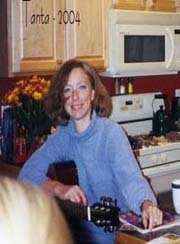 In their preliminary proposed definition of a “QRM,” regulators tried to define a QRM as a mortgage with so little risk that risk-retention to ensure mortgage players would have “skin in the game” was “unimportant.” Not surprisingly, the original proposed definition of a QRM included a hefty (20% down) down payment, a DTI no greater than 36%, had restrictions on a borrower’s credit, and excluded most of the loan features excluded from a QM. The real estate and mortgage industry lobbyists who had argued for a QRM exemption were stunned, even though the regulators’ “framework” of (1) assuming that risk-retention was a “good thing” (and should be applied to the bulk of mortgages backing private-label RMBS), and (2) only “extremely” low risk mortgages should be exempted from this requirement made perfect sense. Real estate and mortgage industry folks started lobbying hard against this QRM proposal, and (1) massively inflated the “costs” to issuers/originators of the risk-retention requirement – which would be based on to consumers; (2) argued that many potential borrowers would be excluded from getting mortgage credit; and (3) argued that having a QM definition that differed from a QRM definition would add to the growing regulatory burden being placed on mortgage lenders, and lobbied extremely hard to make the two definitions the same – even though the legislation explicitly differentiated between the two. This latter argument was mildly humorous, in that the only reason the legislation HAD both a QM and a QRM was because of real estate and mortgage industry lobbyists! An alternative and more logical approach would have been for regulators to decide that there simply WAS no mortgage that was so inherently low risk that it made sense to exempt such a mortgage from the risk-retention requirement, which would effectively have eliminated the concept of a QRM. If they had done so, then the “burden” on the industry of having both a QM and a QRM would have been lifted. Making the QM and the QRM essentially the same pretty much violates the intent of the Dodd-Frank law, in that the QM definition has very little to do with risk, while the QRM was explicitly supposed to be related to risk. E.g., a 30-year fully amortizing loan with no down payment to a borrower with a FICO score of 580, no current debt outstanding but also hardly any assets, and a front-end debt-to-income ratio of 43% would be deemed a qualified mortgage, even though by any standard such a mortgage would be viewed as extremely risky! An interest-only loan to an extremely wealthy borrower with an 800 credit score who made a 40% down payment would not be a QM. If the current proposal is finalized as is, then the risk-retention requirement for private-label RMBS, which was very explicitly designed to better align the interests of issuers/originators and investors, will effectively be gone. That may not be bad, in that it was not clear if a 5% risk-retention requirement would really alter behavior. However, risk retention was a clear INTENT of legislators in Dodd-Frank, and real-estate and mortgage lobbyists have effectively eliminated it for the vast bulk of mortgages that will be originated. Commercial banks and savings institutions insured by the Federal Deposit Insurance Corporation (FDIC) reported aggregate net income of $42.2 billion in the second quarter of 2013, a $7.8 billion (22.6 percent) increase from the $34.4 billion in profits that the industry reported a year earlier. This is the 16th consecutive quarter that earnings have registered a year-over-year increase. Increased noninterest income, lower noninterest expenses, and reduced provisions for loan losses accounted for the increase in earnings from a year ago. The number of problem banks continued to decline. The number of banks on the FDIC's "Problem List" declined from 612 to 553 during the quarter. The number of "problem" banks is down nearly 40 percent from the recent high of 888 institutions at the end of first quarter 2011. Twelve FDIC-insured institutions failed in the second quarter of 2013, up from four failures in the first quarter. Thus far in 2013, there have been 20 failures, compared to 40 during the same period in 2012. This graph shows the dollar value of Residential REO for FDIC insured institutions. Note: The FDIC reports the dollar value and not the total number of REOs. The dollar value of 1-4 family residential Real Estate Owned (REOs, foreclosure houses) declined from $7.89 billion in Q1 to $6.98 Billion in Q2. This is the lowest level of REOs since Q4 2007. 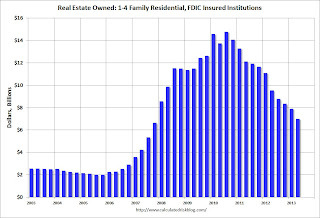 The dollar value of FDIC insured REO peaked at $14.8 Billion in Q3 2010. 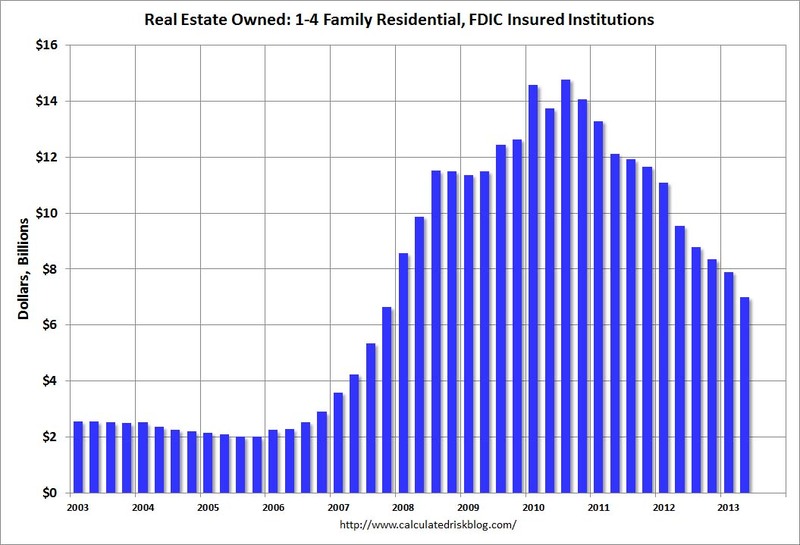 Even in good times, the FDIC insured institutions have about $2.5 billion in residential REO, so the FDIC insured institutions are about two-thirds of the way back to normal levels. Note: CoreLogic will release their Q2 negative equity report in the next couple of weeks. For Q1, CoreLogic reported there were 9.7 million properties with negative equity, and that will be down further in Q2. According to the second quarter Zillow Negative Equity Report, the national negative equity rate continued to fall in the second quarter, dropping to 23.8% of all homeowners with a mortgage from 25.4% in the first quarter of 2013. The negative equity rate has been continually falling for the past five quarters, with the second quarter of 2013 being down significantly from the second quarter of 2012 at 30.9% – a decrease of more than 7 percentage points. In the second quarter of 2013, more than 805,000 American homeowners were freed from negative equity. However, more than 12 million homeowners with a mortgage remain underwater ... Of all homeowners – roughly one-third of homeowners do not have a mortgage and own their homes free and clear – 16.7% are underwater. The following graph from Zillow shows negative equity by Loan-to-Value (LTV) in Q2 2013 compared to Q2 2012. 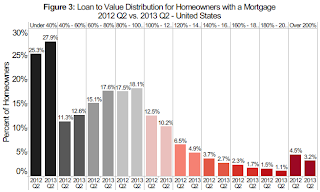 Figure 3 shows the loan-to-value (LTV) distribution for homeowners with a mortgage in the nation in 2013 Q2 vs. 2012 Q2. Even though many homeowners are still underwater and haven’t crossed the 100% LTV threshold to enter into positive equity, they are moving in the right direction. ... On average, a U.S. homeowner in negative equity owes $74,700 more than what their house is worth, or 42.3% more than the home’s value. While roughly a quarter of homeowners with a mortgage are underwater, 92% of these homeowners are current on their mortgages and continue to make payments. Almost half of the borrowers with negative equity have a LTV of 100% to 120% (the light red columns). Most of these borrowers are current on their mortgages - and they have probably either refinanced with HARP or the loans are well seasoned (most of these properties were purchased in the 2004 through 2006 period, so borrowers have been current for eight years or so). In a few years, these borrowers will have positive equity. The key concern is all those borrowers with LTVs above 140% (about 8.7% of properties with a mortgage according to Zillow). It will take many years to return to positive equity ... and a large percentage of these properties will eventually be distressed sales (short sales or foreclosures). Real gross domestic product -- the output of goods and services produced by labor and property located in the United States -- increased at an annual rate of 2.5 percent in the second quarter of 2013 (that is, from the first quarter to the second quarter), according to the "second" estimate released by the Bureau of Economic Analysis. ... In the advance estimate, the increase in real GDP was 1.7 percent. The upward revision to the percent change in real GDP primarily reflected an upward revision to exports, a downward revision to imports, and an upward revision to private inventory investment that were partly offset by a downward revision to state and local government spending. In the week ending August 24, the advance figure for seasonally adjusted initial claims was 331,000, a decrease of 6,000 from the previous week's revised figure of 337,000. The 4-week moving average was 331,250, an increase of 750 from the previous week's unrevised average of 330,500. The previous week was revised up from 336,000. The dashed line on the graph is the current 4-week average. The four-week average of weekly unemployment claims increased to 331,250. The 4-week average is near the lowest level since November 2007 (before the recession started). Claims were close to the 330,000 consensus forecast. Across the country, a growing number of single-family rentals provide an option for many who lost their homes in the housing crash through foreclosure and for those who cannot obtain a mortgage under today’s tougher credit conditions. But the decline in homeownership is also changing many neighborhoods in profound ways, including reduced home values, lower voter turnout and political influence, less social stability and higher crime. “When there are fewer homeowners, there is less ‘self-help,’ like park and neighborhood cleanup, neighborhood watch,” said William M. Rohe, a professor at the University of North Carolina at Chapel Hill who has just completed a review of current research on homeownership’s effects. • 8:30 AM ET, The initial weekly unemployment claims report will be released. 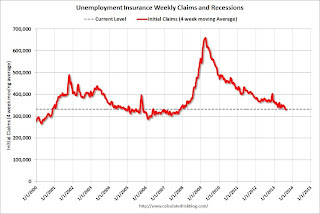 The consensus is for claims to decrease to 330 thousand from 336 thousand last week. • Note: The FDIC Q2 Quarterly Banking Profile could be released tomorrow or Friday. Freddie Mac reported that the Single-Family serious delinquency rate declined in July to 2.70% from 2.79% in June. Freddie's rate is down from 3.42% in July 2012, and this is the lowest level since April 2009. 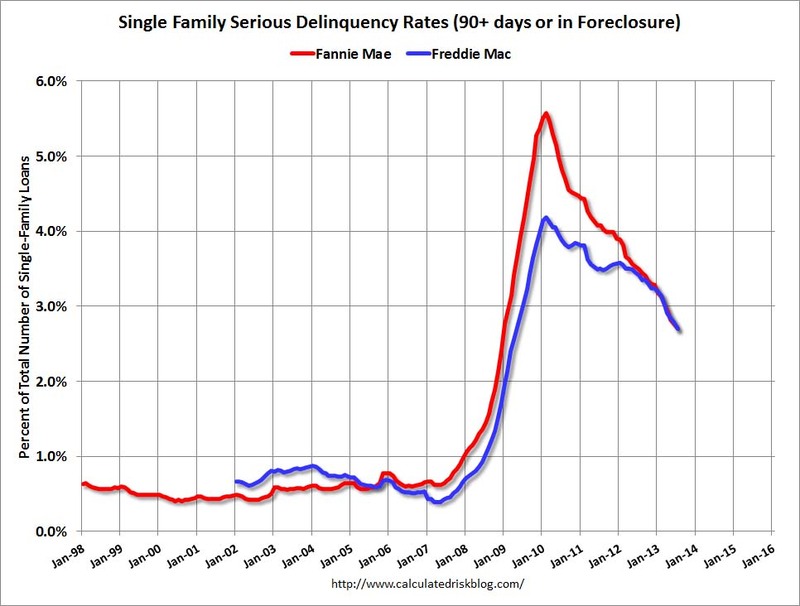 Freddie's serious delinquency rate peaked in February 2010 at 4.20%. I'm frequently asked when the distressed sales will be back to normal levels, and that will happen when the percent of seriously delinquent loans (and in foreclosure) is back to normal. Note: Fannie Mae will report their Single-Family Serious Delinquency rate for July next week. Although this indicates some progress, the "normal" serious delinquency rate is under 1%. At the recent rate of improvement, the serious delinquency rate will not be under 1% until 2016 or so. Therefore I expect a fairly high level of distressed sales for 2 to 3 more years (mostly in judicial states). Dean Baker: "Rising Mortgage Rates Did Not Affect June Case-Shiller Data"
The Washington Post ... article today on the Case-Shiller June price index attributed the slower price growth in part to higher interest rates. This makes no sense. 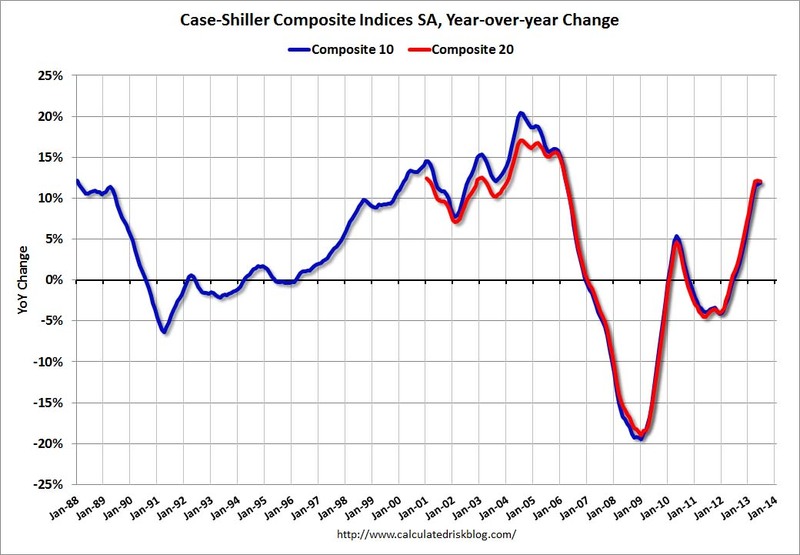 The Case-Shiller index is an average of three months data. The June release is based on the price of houses that were closed in April, May, and June. Since there is typically 6-8 weeks between when a contract is signed and when a sale is completed these houses would have come under contract in the period from February to May. This is a period before there was any real rise in interest rates. ... We will first begin to see a limited impact of higher interest rates in the Case Shilller index in the July data and the impact of the rise will not be fully apparent until the October index is released. One addition: we will not see any impact of higher mortgage rates until at least the "August" Case-Shiller report is released (see earlier post), and - as Baker notes - the impact will not be fully apparent in the Case-Shiller index until the "October" report is released because of the 3 month average. However other prices indexes - like Zillow and LPS - will pick up any impact sooner. The Case-Shiller house price indexes for June were released yesterday. Zillow has started forecasting Case-Shiller a month early - and I like to check the Zillow forecasts since they have been pretty close. Note: Zillow makes a strong argument that the Case-Shiller index is currently overstating national house price appreciation. 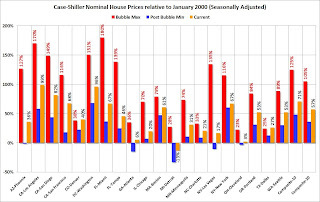 The Case-Shiller data for June (2013 Q2) came out [yesterday] and, based on this information and the July 2013 Zillow Home Value Index (released last week), we predict that next month’s Case-Shiller data (July 2013) will show that the 20-City Composite Home Price Index (non-seasonally adjusted [NSA]), as well as the 10-City Composite Home Price Index (NSA) increased 12.5 percent on a year-over-year basis. The seasonally adjusted (SA) month-over-month change from June to July will be 1.0 percent for the 20-City Composite and 1.2 percent for the 10-City Composite Home Price Indices (SA). All forecasts are shown in the table below. Officially, the Case-Shiller Composite Home Price Indices for June will not be released until Tuesday, September 24. As home value appreciation is beginning to moderate, the Case-Shiller indices will continue to show an inflated sense of national home value appreciation. First signs of a slowdown in monthly appreciation are present, although these slowdowns are fairly timid. The Case-Shiller indices are biased toward the large, coastal metros currently seeing enormous home value gains, and they include foreclosure resales. The inclusion of foreclosure resales disproportionately boosts the index when these properties sell again for much higher prices — not just because of market improvements, but also because the sales are no longer distressed. In contrast, the ZHVI does not include foreclosure resales and shows home values for July 2013 up 6 percent from year-ago levels. 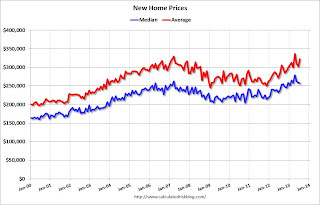 We expect home value appreciation to continue to moderate through the end of 2013 and into 2014, rising 4.8 percent between July 2013 and July 2014. The main drivers of this moderation include rising mortgage rates, less investor participation – decreasing demand – and increasing for-sale inventory supply. Further details on our forecast of home values can be found here, and more on Zillow’s full July 2013 report can be found here. To forecast the Case-Shiller indices, we use the June Case-Shiller index level, as well as the July Zillow Home Value Index (ZHVI), which is available more than a month in advance of the Case-Shiller index, paired with July foreclosure resale numbers, which Zillow also publishes more than a month prior to the release of the Case-Shiller index. Together, these data points enable us to reliably forecast the Case-Shiller 10-City and 20-City Composite indices. The following table shows the Zillow forecast for the July Case-Shiller index. The Pending Home Sales Index, a forward-looking indicator based on contract signings, declined 1.3 percent to 109.5 in July from 110.9 in June, but is 6.7 percent above July 2012 when it was 102.6; the data reflect contracts but not closings. Pending sales have stayed above year-ago levels for the past 27 months. Contract signings usually lead sales by about 45 to 60 days, so this would usually be for closed sales in August and September. Note: It appears some buyers pushed to close in July because of rising mortgage rates (People who signed contracts in May probably locked in mortgage rates, and they wanted to close before the lock expired). So I expect closed sales in August to decline more than the pending home sales index would indicate. The Refinance Index decreased 5 percent from the previous week. 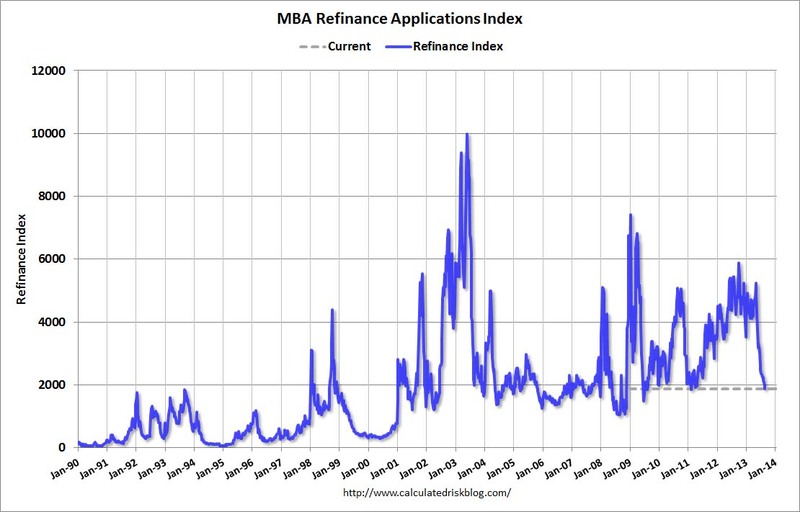 The Refinance Index has fallen 64.2 percent from its recent peak the week of May 3, 2013. The seasonally adjusted Purchase Index increased 2 percent from one week earlier. The average contract interest rate for 30-year fixed-rate mortgages with conforming loan balances ($417,000 or less) increased to 4.80 percent, the highest rate since April 2011, from 4.68 percent, with points decreasing to 0.41 from 0.42 (including the origination fee) for 80 percent loan-to-value ratio (LTV) loans. Refinance activity has fallen sharply, decreasing in 14 of the last 16 weeks. This index is down 64.2% over the last 16 weeks. The last time the index declined this far was in late 2010 and early 2011 when mortgage increased sharply with the Ten Year Treasury rising from 2.5% to 3.5%. We've seen a similar increase over the last few months with the Ten Year Treasury yield up from 1.6% to over 2.7% today. 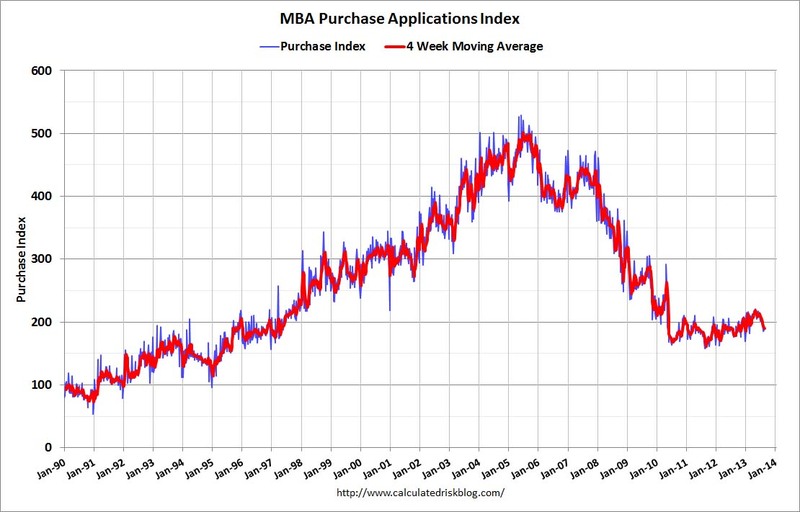 The second graph shows the MBA mortgage purchase index. The purchase index has increased for the last two weeks, and three of the last four. 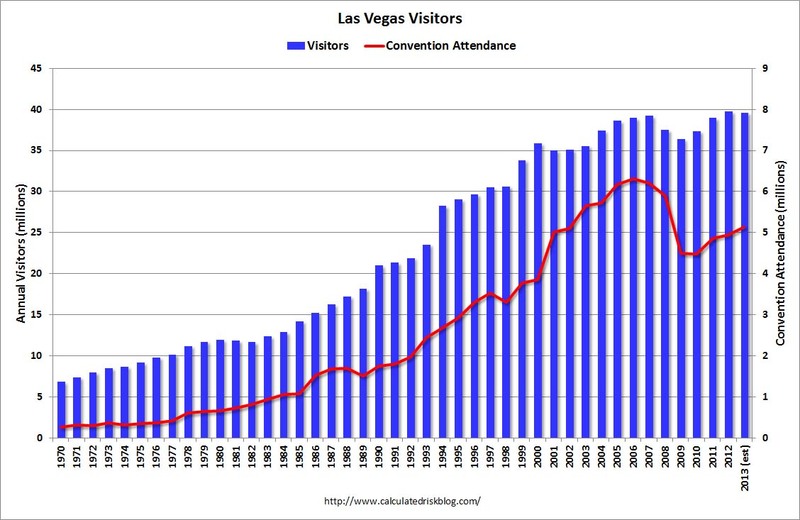 Just an update ... during the recession, I wrote about the troubles in Las Vegas and included a chart of visitor and convention attendance: Lost Vegas. Since then Las Vegas visitor traffic recovered to a new record high in 2012. However convention attendance in 2012 was still about 21% below the peak level in 2006. Here is the data from the Las Vegas Convention and Visitors Authority. The blue bars are annual visitor traffic (left scale), and the red line is convention attendance (right scale). The numbers for 2013 are a projection based on data through June. So far this year - through June - there were 19.9 million visitors to Las Vegas - slightly less than for the first six months of 2012. Convention attendance was at 2.9 million during the first half of 2013, for a pace over 5 million for the first time since 2008 - but still well below the record of 6.3 million in 2006. • 7:00 AM ET, the Mortgage Bankers Association (MBA) will release the results for the mortgage purchase applications index. With higher mortgage rates, the refinance index has fallen sharply over the last few months. 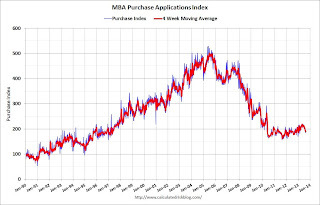 The key will be to watch the purchase application index. • At 10:00 AM, the NAR will release the Pending Home Sales Index for July. The consensus is for a 1.0% decrease in the index. 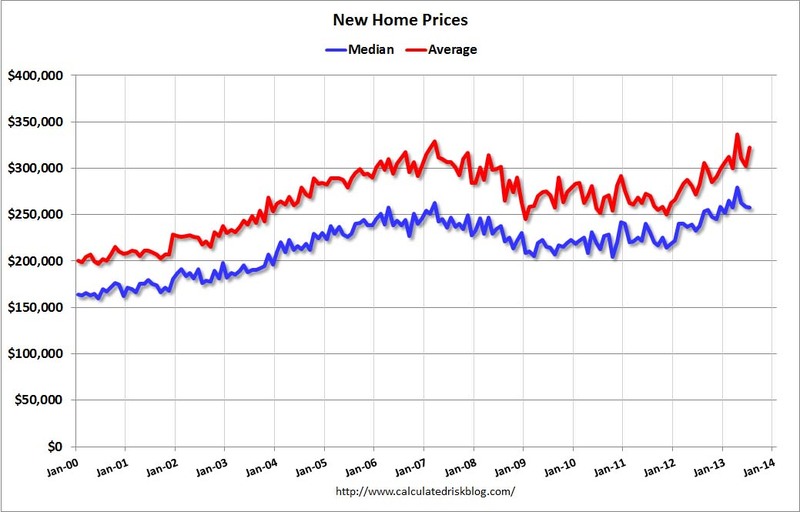 Lawler: Measuring Changes in Home Prices is Difficult! Below is a table showing the latest YOY % changes in various entities’ home price indexes for the metro areas covered in today’s Case Shiller home price report, as well as “national” HPIs. The YOY changes are for the period ended in June, with Case-Shiller, FHFA expanded, and Zillow effectively being quarterly averages; CoreLogic a weighted 3-month moving average; and LPS and FNC being “June.” Zillow does not include foreclosure resales in constructing its HVI, while LPS’ HPI “reflects” non-distressed sales, as it “takes into account” price discounts for REO and short sales. FNC’s RPI is a “hedonic” price index, as is (pretty much) Zillow’s HVI. CoreLogic produces HPIs for all of the metro areas below, but only releases to the public the ones shown below. Note that in some cases (e.g., NY), Case-Shiller’s “metro area” definition differs from the other entities (it is broader). The biggest “outliers” are the “hedonic” home price indexes, which attempt to take into account the characteristics of homes sold. FNC’s RPI for many metro areas seem “most strange” – the RPIs for DC and Portland showed virtually no change from a year ago, which just doesn’t seem right. And FNC’s “national” (100 metro area) RPI gain of 3.7% over the last year seems way too low. Even if all of the metro/regional/state HPIs from these entities “matched up,” the various entities’ “national” HPIs would show different growth rates. Case-Shiller constructs a “national” HPI from Census division HPIs with weights based on each division’s share of the market value of the housing stock from Census 2000. FHFA constructs a “national” HPI using weights based on state shares of the housing stock in units using the latest available ACS data. CoreLogic does not “build up” a national HPI from regional HPIs, but instead aggregates all transactions across the county. Zillow’s HVI is a “median” home-value measure, I believe using all homes for which it has a “Zestimate.” I’m not rightly sure how LPS or FNC construct their “national” HPIs. The method used to construct a “national” HPI from state/regional HPIs can have a material impact. As I noted last week, if CoreLogic used Census 2000 market value weight applied to its state HPIs, its “national” HPI for June would have been up 9.4% YOY, compared to the reported 11.9%. And if the FHFA had applied Census 2000 market value weights to its state HPIs, its “national” HPI for June would have bee up 8.1%, instead of the reported 7.6%. 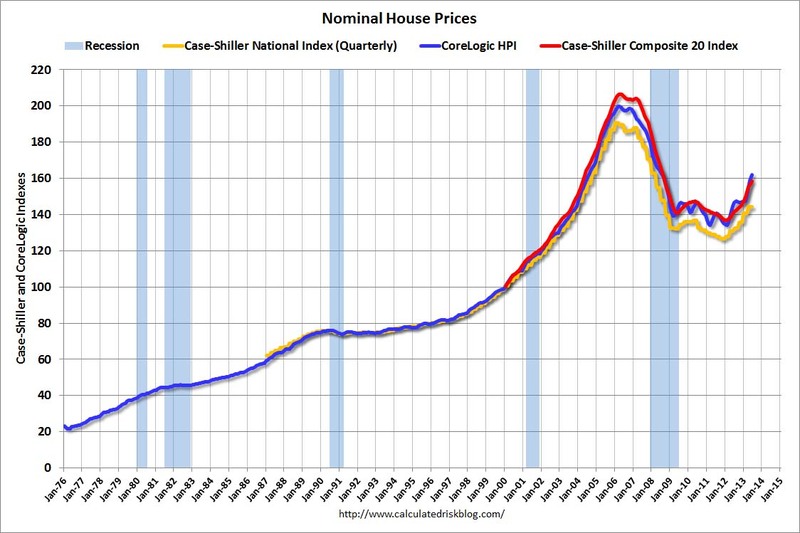 The Case Shiller “national” HPI for “June” (Q2) was up 10.1% YOY. 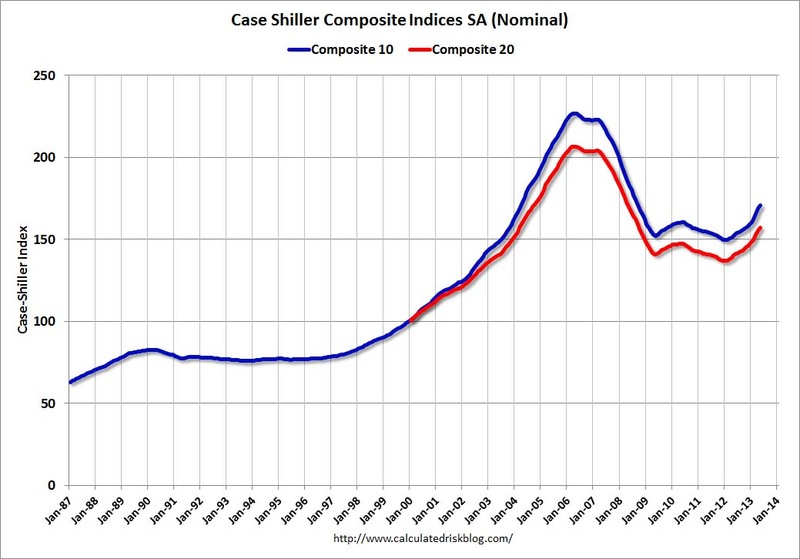 Case-Shiller doesn’t produce state HPIs and doesn’t release its Census division HPIs to the public. The index for the number of employees moved up to 6 in August following a flat reading a month ago. The indicator for the average manufacturing workweek also gained, picking up six points to post a reading of 8. In addition, average wage growth intensified, pushing the index to 13 from July's reading of 8. Manufacturers planned to increase hiring in the six months ahead; the marker for the number of employees picked up four points to settle at 9, while the index for the average workweek moved up to 10 from last month's reading of 8. Employers also anticipated robust wage growth, pushing that index to 28 in August from 21. The New York and Philly Fed surveys are averaged together (dashed green, through August), and five Fed surveys are averaged (blue, through August) including New York, Philly, Richmond, Dallas and Kansas City. 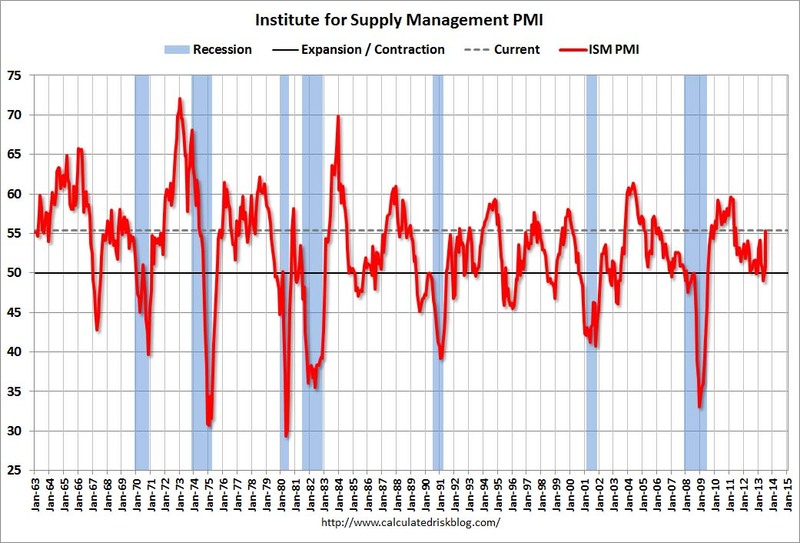 The Institute for Supply Management (ISM) PMI (red) is through July (right axis). All of the regional surveys showed expansion in August, and overall at about the same pace as in July. 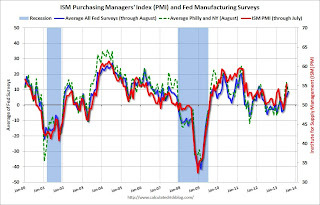 The ISM index for July will be released next Tuesday, Sept 3rd. 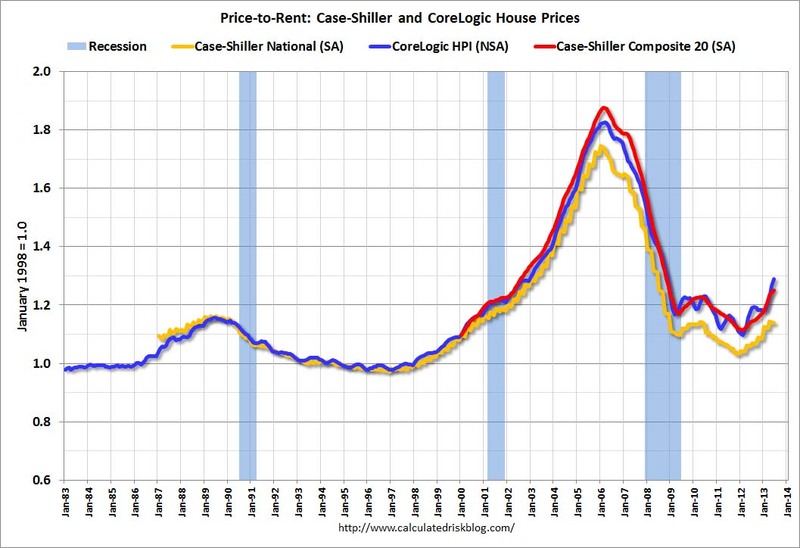 • The Case-Shiller index released this morning was for June, and it is actually a 3 month of average prices in April, May and June. 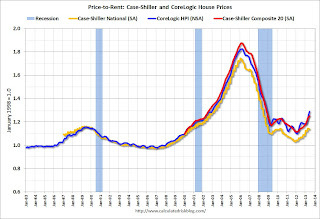 I think price increases have slowed recently based on agent reports (a combination of a little more inventory and higher mortgage rates), but this slowdown in price increases will not show up for several months in the Case-Shiller index because of the reporting lag and because of the three month average. I expect to see smaller year-over-year price increases going forward and some significant deceleration towards the end of the year. 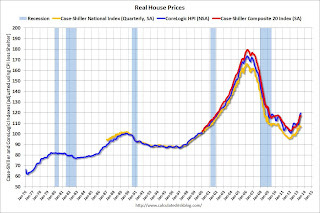 • It appears the Case-Shiller index is currently overstating price increases for most homeowners, both because of the handling of distressed sales and the weighting of some coastal areas. I also think it is important to look at prices in real terms (inflation adjusted). 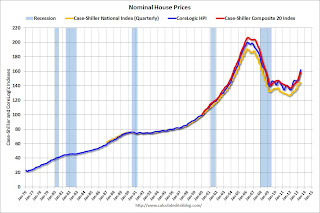 Case-Shiller, CoreLogic and others report nominal house prices. As an example, if a house price was $200,000 in January 2000, the price would be close to $275,000 today adjusted for inflation. 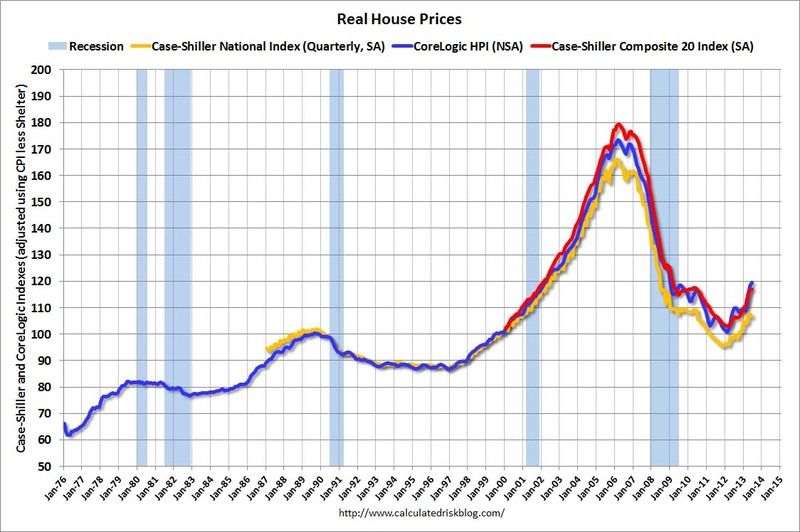 The first graph shows the quarterly Case-Shiller National Index SA (through Q2 2013), and the monthly Case-Shiller Composite 20 SA and CoreLogic House Price Indexes (through June) in nominal terms as reported. 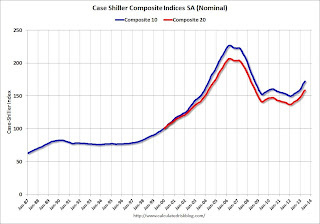 In nominal terms, the Case-Shiller National index (SA) is back to Q4 2003 levels (and also back up to Q4 2008), and the Case-Shiller Composite 20 Index (SA) is back to April 2004 levels, and the CoreLogic index (NSA) is back to August 2004. In real terms, the National index is back to Q4 2000 levels, the Composite 20 index is back to November 2001, and the CoreLogic index back to March 2002. In real terms, house prices are back to early '00s levels. 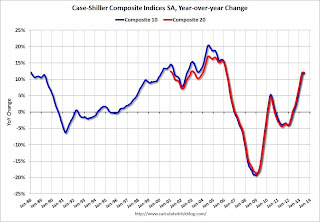 On a price-to-rent basis, the Case-Shiller National index is back to Q4 2000 levels, the Composite 20 index is back to April 2002 levels, and the CoreLogic index is back to December 2002. 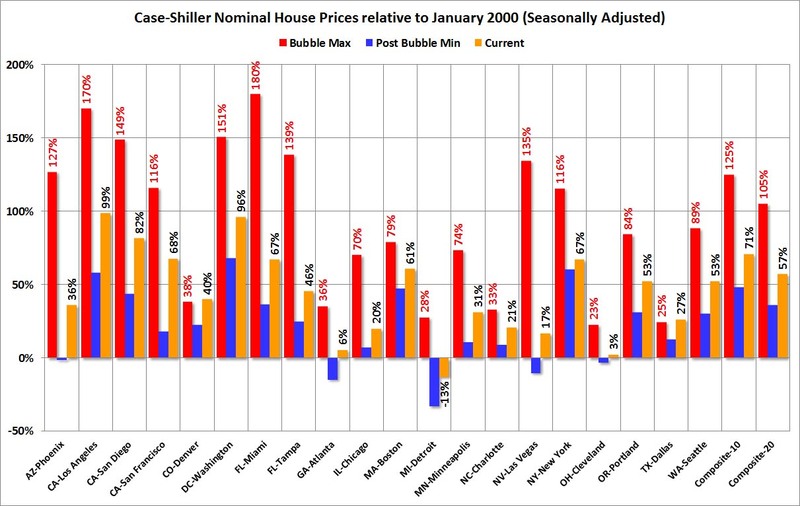 As an example, at the peak, prices in Phoenix were 127% above the January 2000 level. Then prices in Phoenix fell slightly below the January 2000 level, and are now up 36% above January 2000. Two cities - Denver and Dallas - are at new highs (no other Case-Shiller Comp 20 city is close). Detroit prices are still below the January 2000 level. This release includes prices for 20 individual cities, two composite indices (for 10 cities and 20 cities) and the Q2 National index. All 20 cities showed positive monthly returns for at least the third consecutive month. Six cities – Charlotte, Cleveland, Las Vegas, Minneapolis, New York and Tampa – showed acceleration. Atlanta took the lead with a return of 3.4% as San Francisco dropped to +2.7% in June from +4.3% in May. New York posted a gain of 2.1%, its highest since July 2002. The Composite 10 index is off 24.1% from the peak, and up 1.1% in June (SA). The Composite 10 is up 15.1% from the post bubble low set in Jan 2012 (SA). The Composite 20 index is off 23.4% from the peak, and up 0.9% (SA) in June. The Composite 20 is up 15.7% from the post-bubble low set in Jan 2012 (SA). The Composite 10 SA is up 11.9% compared to June 2012. The Composite 20 SA is up 12.1% compared to June 2012. This was the thirteen consecutive month with a year-over-year gain and it appears the YoY change might be starting to slow. Prices increased (SA) in 15 of the 20 Case-Shiller cities in June seasonally adjusted. Prices in Las Vegas are off 50.2% from the peak, and prices in Denver and Dallas are at new highs. This was close to the consensus forecast for a 12.2% YoY increase. I'll have more on prices later. I don't think Summers is a good choice for Fed Chair. Also I doubt any delay is because he is still being vetted, more likely they are still trying to find the confirmation votes in the Senate. • At 10:00 AM, Conference Board's consumer confidence index for August. The consensus is for the index to decrease to 78.0 from 80.3. 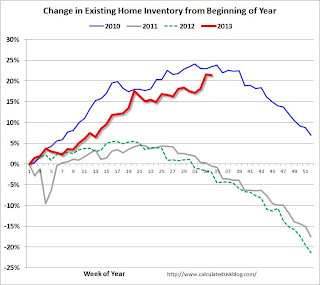 Here is another weekly update on housing inventory: One of key questions for 2013 is Will Housing inventory bottom this year?. Since this is a very important question, I'm tracking inventory weekly in 2013. There is a clear seasonal pattern for inventory, with the low point for inventory in late December or early January, and then peaking in mid-to-late summer. The Realtor (NAR) data is monthly and released with a lag (the most recent data was for July). However Ben at Housing Tracker (Department of Numbers) has provided me some weekly inventory data for the last several years. This is displayed on the graph below as a percentage change from the first week of the year (to normalize the data). In 2010 (blue), inventory increased more than the normal seasonal pattern, and finished the year up 7%. However in 2011 and 2012, there was only a small increase in inventory early in the year, followed by a sharp decline for the rest of the year. 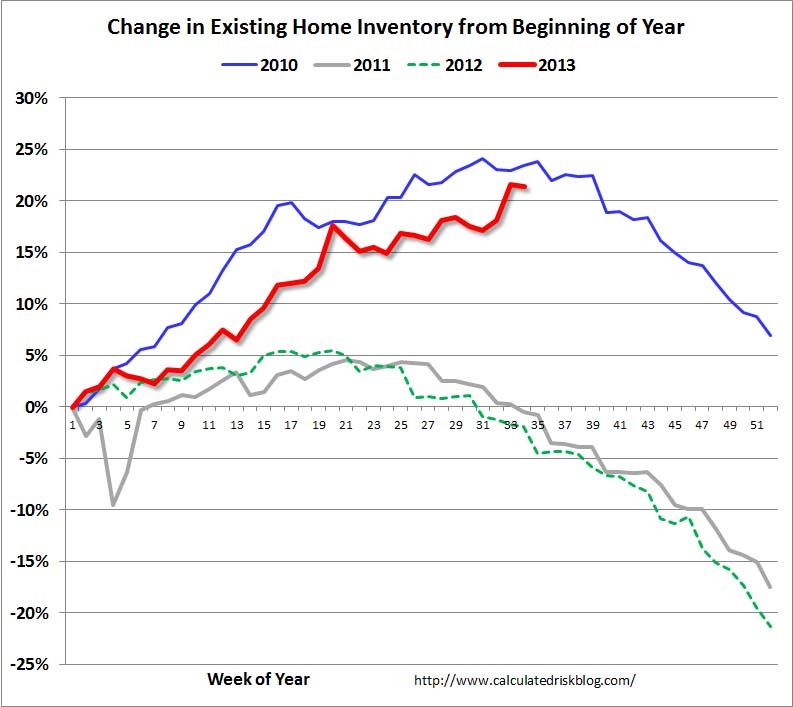 So far in 2013, inventory is up 21.4%, and there might be some further increases over the next few weeks. It is important to remember that inventory is still very low, and is down 5.7% from the same week last year according to Housing Tracker. This strongly suggests inventory bottomed early this year. I expect inventory to be up year-over-year very soon (maybe in September), and I also expect the seasonal decline to be less than usual at the end of the year. This increase in inventory also means price increases will slow. NY Times: "For Laid-Off Older Workers, Age Bias Is Pervasive"
[A] substantial number of older workers who lost jobs — even those lucky enough to be re-employed — are still suffering. Two-thirds in that age group who found work again are making less than they did in their previous job; their median salary loss is 18 percent compared with a 6.7 percent drop for 20- to 24-year-olds. I think the age groups that are hit the hardest by a recession are those just entering the workforce, and those nearing retirement. For those entering the workforce, it is tough to find that first job - and they face a long period of lower wages. For those who are laid-off nearing retirement, it is very difficult to find a new job and learn new skills ... and the pay is usually substantially less. Notes: I follow several house price indexes (Case-Shiller, CoreLogic, LPS, Zillow, FHFA, FNC and more). The timing of different house prices indexes can be a little confusing. LPS uses June closings only (not a three month average like Case-Shiller or a weighted average like CoreLogic), excludes short sales and REOs, and is not seasonally adjusted. Lender Processing Services ... today released its latest LPS Home Price Index (HPI) report, based on June 2013 residential real estate transactions. The LPS HPI combines the company’s extensive property and loan-level databases to produce a repeat sales analysis of home prices as of their transaction dates every month for each of more than 18,500 U.S. ZIP codes. The LPS HPI represents the price of non-distressed sales by taking into account price discounts for REO and short sales. The LPS HPI is off 15.2% from the peak in June 2006. Note: The press release has data for the 20 largest states, and 40 MSAs. LPS shows prices off 46.6% from the peak in Las Vegas, 37.6% off from the peak in Riverside-San Bernardino, CA (Inland Empire), and at new peaks in Austin, Dallas, Denver and Houston! Note: Case-Shiller for June will be released tomorrow. Texas factory activity increased but at a slower pace in August, according to business executives responding to the Texas Manufacturing Outlook Survey. The production index, a key measure of state manufacturing conditions, remained positive but fell from 11.4 to 7.3. Other measures of current manufacturing activity also indicated slower growth in August. The new orders index was positive for the fourth month in a row, although it moved down from 10.8 to 5.4. The shipments index also posted a fourth consecutive positive reading but slipped 6 points to 11.4. The capacity utilization index fell from 12.2 to 4.6. Perceptions of broader business conditions improved again in August, with the general business activity and company outlook indexes posting their third consecutive positive readings. The general business activity index edged up from 4.4 to 5.0, and the company outlook index rose from 4.5 to 7.3. Labor market indicators reflected an increase in hiring but sharply reduced workweeks. The employment index rose 2 points to 11.2, its highest reading in a year. Twenty percent of firms reported hiring new workers compared with 8 percent reporting layoffs. The hours worked index fell 11 points to -9.9, its lowest reading in nearly four years. Prices and wages rose in August. The raw materials price index came in at 10, down from its previous reading of 15.9 but still indicative of higher input costs than in July. The finished goods price index was positive for the first time since March, rising 5 points to a reading of 4, suggesting selling prices were up from July as well. The wages and benefits index was positive but edged down to 14.5, although the great majority of manufacturers continued to note no change in compensation costs. Looking ahead, 34 percent of respondents anticipate further increases in raw materials prices over the next six months, while 25 percent expect higher finished goods prices. According to the First Look report for July to be released today by Lender Processing Services (LPS), the percent of loans delinquent decreased in July compared to June, and declined about 9% year-over-year. Also the percent of loans in the foreclosure process declined further in July and were down 31% over the last year. LPS reported the U.S. mortgage delinquency rate (loans 30 or more days past due, but not in foreclosure) decreased to 6.41% from 6.68% in June. Note: Some of the decrease in short term delinquencies in July is seasonal. The normal rate for delinquencies is around 4.5% to 5%. The percent of loans in the foreclosure process declined to 2.82% in July from 2.93% in June. The number of delinquent properties, but not in foreclosure, is down 327,000 properties, and the number of properties in the foreclosure process is down 636,000 properties year-over-year. LPS will release the complete mortgage monitor for July in early September. • 8:30 AM ET, Durable Goods Orders for July from the Census Bureau. The consensus is for a 4.0% decline in durable goods orders. The expected decline is from the volatile aircraft orders (and other transportation), and the consensus is for a 0.3% gain ex-transportation. • At 10:30 AM, Dallas Fed Manufacturing Survey for August. The consensus is a reading of 4.5, up from 4.4 in July (above zero is expansion). • During the Day: The LPS First Look at July's mortgage performance data. The Nikkei is up about 0.2%. From CNBC: Pre-Market Data and Bloomberg futures: the S&P and DOW futures are flat (fair value). Oil prices have increased with WTI futures at $107.04 per barrel and Brent at $111.30 per barrel. The spread between WTI and Brent is back (but still small). Below is a graph from Gasbuddy.com for nationwide gasoline prices. Nationally prices are mostly moving sideways. If you click on "show crude oil prices", the graph displays oil prices for WTI, not Brent; gasoline prices in most of the U.S. are impacted more by Brent prices. 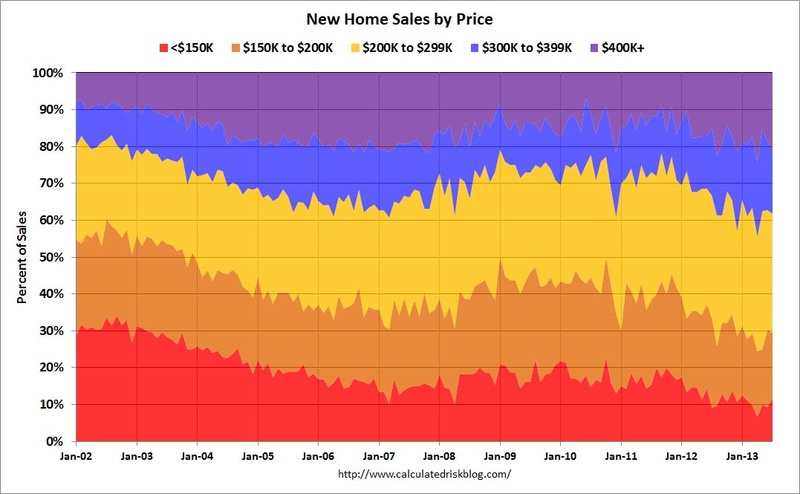 For new readers: I was very bearish on the economy when I started this blog in 2005 - back then I wrote mostly about housing (see: LA Times article and more here for comments about the blog). I started looking for the sun in early 2009, and now I'm even more optimistic looking out over the next few years. Early this year I wrote The Future's so Bright .... In that post I outlined why I was becoming more optimistic, even though there might be too much deficit reduction in 2013. As I noted, "ex-austerity, we'd probably be looking at a decent year" in 2013. And of course - looking forward - Congress remains the key downside risk to the U.S. economy. It still appears economic growth will pickup over the next few years. With a combination of growth in the key housing sector, a significant amount of household deleveraging behind us, the end of the drag from state and local government layoffs (four years of austerity mostly over), some loosening of household credit, and the Fed staying accommodative (even if the Fed starts to taper, the Fed will remain accommodative). 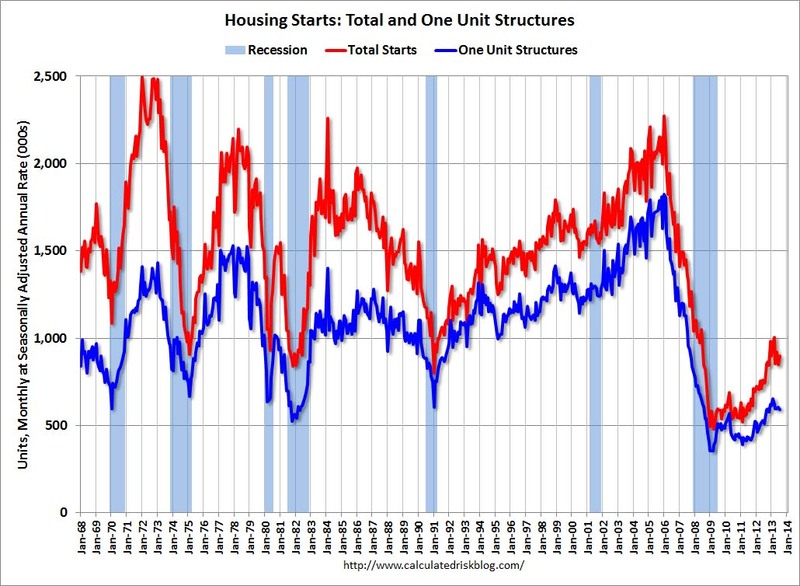 This graph shows total and single family housing starts. Even after the 28.1% in 2012, the 780 thousand housing starts in 2012 were the fourth lowest on an annual basis since the Census Bureau started tracking starts in 1959. Starts averaged 1.5 million per year from 1959 through 2000. Demographics and household formation suggests starts will return to close to that level over the next few years. That means starts will come close to doubling from the 2012 level. 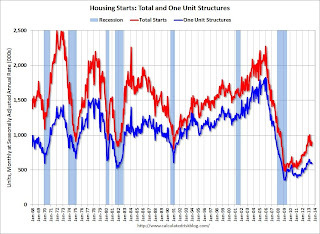 Residential investment and housing starts are usually the best leading indicator for economy, so this suggests the economy will continue to grow over the next couple of years. 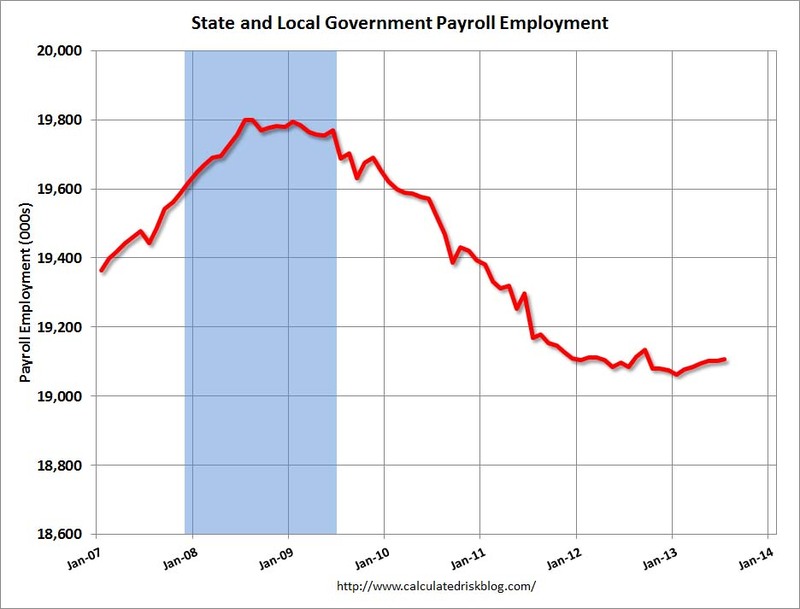 The second graph shows total state and government payroll employment since January 2007. State and local governments lost 129,000 jobs in 2009, 262,000 in 2010, and 230,000 in 2011. In 2012, state and local government employment declined by 26,000 jobs. In 2013, state and local employment is up 31 thousand so far. 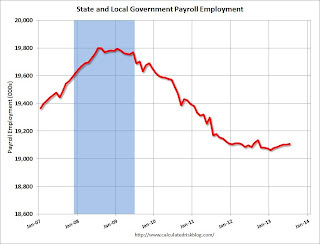 So it appears that most of the state and local government layoffs are over and the drag on the economy is over. 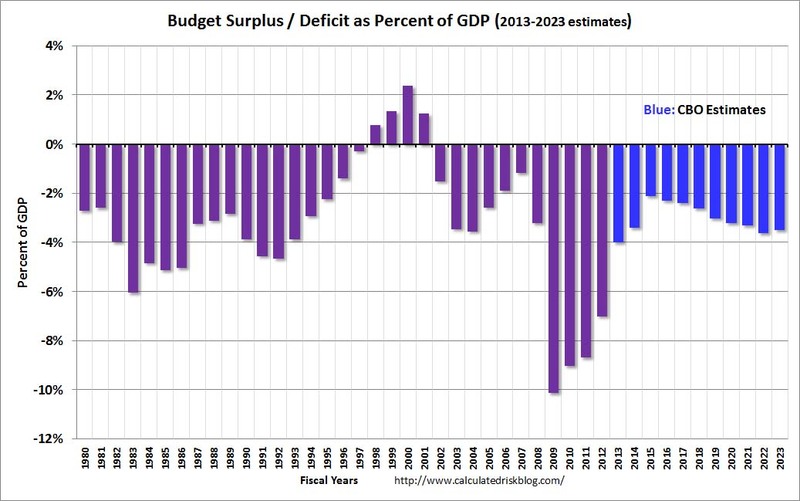 And here is a key graph on the US deficit. This graph, based on the CBO's May projections, shows the actual (purple) budget deficit each year as a percent of GDP, and an estimate for the next ten years based on estimates from the CBO. As we've been discussing, the US deficit as a percent of GDP has been declining, and will probably decline to under 3% in 2015 before starting to increase again. 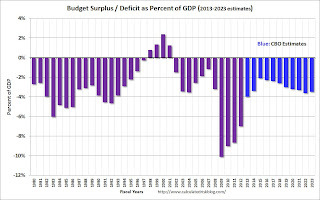 Of course many people (and many politicians) have been surprised by the rapid decline in the deficit (it was obvious to those of us paying attention). Note: With 7.4% unemployment, there is a strong argument for less deficit reduction in the short term, but that view doesn't seem to be gaining any traction. This graph from the the NY Fed shows aggregate consumer debt decreased further in Q2 2013. This was mostly due to a decline in mortgage debt. From the NY Fed: "In Q2 2013 total household indebtedness fell to $11.15 trillion; 0.7 percent lower than the previous quarter and 12 percent below the peak of $12.68 trillion in Q3 2008. Mortgages, the largest component of household debt, fell $91 billion from the first quarter." There will probably more deleveraging ahead (mostly from foreclosures and distressed sales), but this suggests some improvement in household balance sheets. 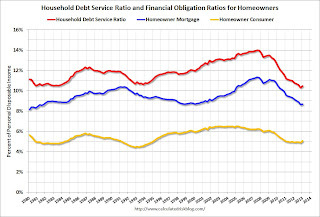 The graph shows the DSR for both renters and homeowners (red), and the homeowner financial obligations ratio for mortgages and consumer debt. The overall Debt Service Ratio increased slightly in Q1, and is just above the record low set in Q4 2012 thanks to very low interest rates. The homeowner's financial obligation ratio for consumer debt also increased slightly in Q1, and is back to levels last seen in early 1995. 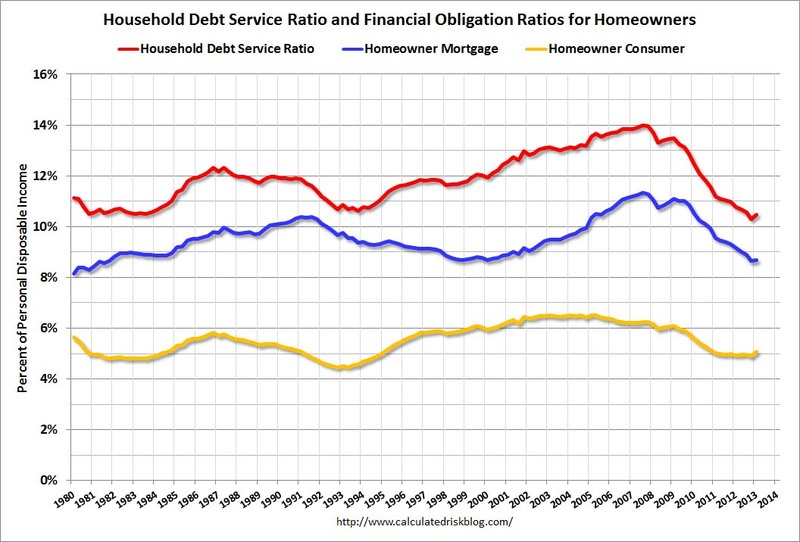 The blue line is the homeowner's financial obligation ratio for mortgages (blue). This ratio increased rapidly during the housing bubble, and continued to increase until 2008. With falling interest rates, and less mortgage debt (mostly due to foreclosures), the mortgage ratio has declined to 1998 (and 1981) levels. Overall it appears the economy is poised for more growth over the next few years. And in the longer term, I remain very optimistic too. I mentioned a few long term risks in my January post, but I also mentioned that I wasn't as concerned as many others about the aging of the population. By 2020, eight of the top ten largest cohorts (five year age groups) will be under 40, and by 2030 the top 11 cohorts are the youngest 11 cohorts. The renewing of America was one of the key points I made when I posted the following animation of the U.S population by age, from 1900 through 2060. The population data and estimates are from the Census Bureau (actual through 2010 and projections through 2060). Last year, I said that looking forward I was the most optimistic since the '90s. And things are only getting better. The future's so bright, I gotta wear shades. Here are two graphs I haven't updated for about a year. From the Census Bureau: "The median sales price of new houses sold in July 2013 was $257,200; the average sales price was $322,700." 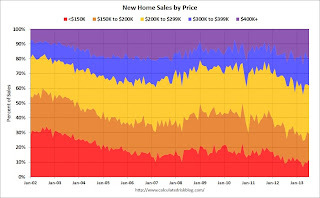 The percent of home over $300K declined to 20% in January 2009. Now it has rebounded to around 38%. And less than 12% were under $150K. The key reports this week are Case-Shiller house prices for June on Tuesday, the second estimate of Q2 GDP on Thursday, and the July Personal Income and Outlays report on Friday. For manufacturing, the Dallas and Richmond regional manufacturing surveys for August will be released this week. 8:30 AM: Durable Goods Orders for July from the Census Bureau. The consensus is for a 4.0% declined in durable goods orders. 10:30 AM: Dallas Fed Manufacturing Survey for August. The consensus is a reading of 4.5, up from 4.4 in July (above zero is expansion). 9:00 AM: S&P/Case-Shiller House Price Index for June. Although this is the June report, it is really a 3 month average of April, May, and June. This graph shows the nominal seasonally adjusted Composite 10 and Composite 20 indexes through May 2012 (the Composite 20 was started in January 2000). The consensus is for a 12.2% year-over-year increase in the Composite 20 index (NSA) for June. The Zillow forecast is for the Composite 20 to increase 12.1% year-over-year, and for prices to increase 1.1% month-to-month seasonally adjusted. 10:00 AM: Conference Board's consumer confidence index for August. The consensus is for the index to decrease to 78.0 from 80.3. 10:00 AM: Richmond Fed Survey of Manufacturing Activity for August. The consensus is for a reading of 0 for this survey, up from minus 11 in July (Above zero is expansion). 10:00 AM ET: Pending Home Sales Index for July. The consensus is for a 1.0% decrease in the index. 8:30 AM: The initial weekly unemployment claims report will be released. 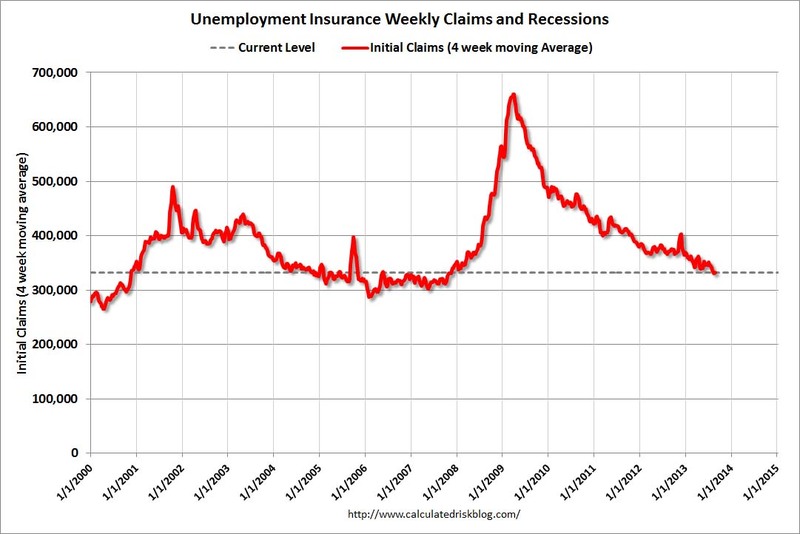 The consensus is for claims to decrease to 330 thousand from 336 thousand last week. 8:30 AM: Q2 GDP (second estimate). This is the second estimate of Q2 GDP from the BEA. 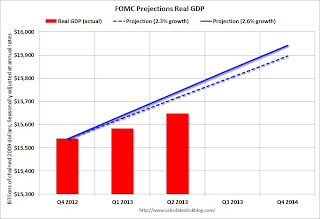 The consensus is that real GDP increased 2.2% annualized in Q2, revised up from the advance estimate of 1.7% in Q2. 8:30 AM ET: Personal Income and Outlays for July. The consensus is for a 0.2% increase in personal income in June, and for a 0.3% increase in personal spending. And for the Core PCE price index to increase 0.2%. 9:45 AM: Chicago Purchasing Managers Index for August. The consensus is for an increase to 53.0, up from 52.3 in July. 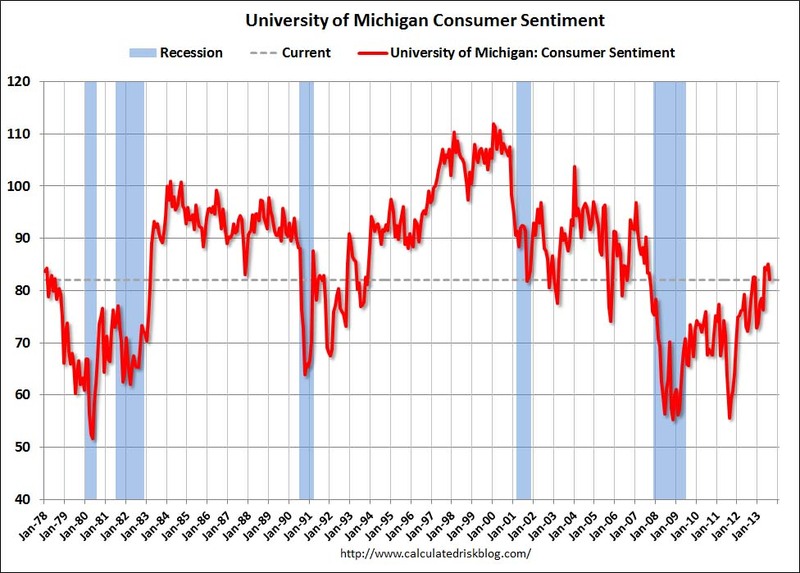 9:55 AM: Reuter's/University of Michigan's Consumer sentiment index (final for July). The consensus is for a reading of 80.0.